Almond milk is creamy, tasty, and full of nutrients. Used in the Middle East for centuries for its stability and availability, almonds are one of the healthiest nuts around, a great source of nutrition. 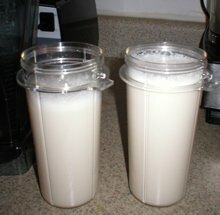 Use almond milk as a base for your smoothies, drink plain, in your tea, to make yogurt, for your cereal, or any way you would use any other milk product. I even use it in place of cream for some recipes. Worried about calcium? Don’t fall prey to the calcium myth. Add nuts to the blender. Add about 3 cups filtered water to the blender. Use less for cream and more for a thinner milk. Blend on high speed for at least 30 seconds or until you see no more big flecks or chunks of nut. 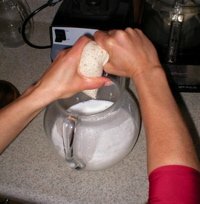 Pour blender contents into a nut milk bag over a pitcher or bowl. Squeeze and twist the bag SLOWLY until most of the liquid is out. If you use a metal strainer, pour the milk into it and use a spoon to swish the almond pulp around, periodically dumping the pulp into another bowl. Repeat until all is strained. Freeze pulp (keeps frozen for a few months) or dehydrate/dry it and grind for use as flour for later recipes. Put the milk into containers and put in the fridge. Lasts 3-5 days. Shake before using. You can use other kinds of nuts for a change in flavor and richness, such as Brazil nuts, hazelnuts, or cashews. Or you can make milks from seeds such as hemp, chia, sesame, and sunflower. Soaking time varies and some are best not soaked. You can add chocolate to make "chocolate milk" or make other kinds of milkshakes by blending ice and strawberries or cinnamon with a sweetener like honey, stevia, dates, or agave. Have fun finding your own variations and uses for all of that beautiful almond milk! (I've heard that nut products should not be given to children who are being weaned, so check with your doctor.) Enjoy! For even more recipes, see my favorite recipe books from these beautiful and inspiring women.